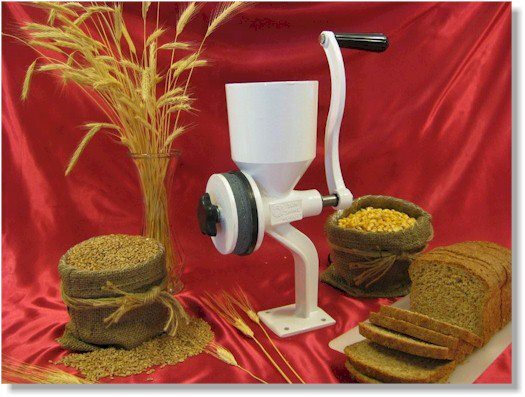 Home / Kitchen / Grain Mills / Grain Mills - Hand Operated / Nazko Nugget Grain Mill – Sunshine – MADE IN THE USA! Nazko Nugget Grain Mill – Sunshine – MADE IN THE USA! The Very Best Hand Operated Flour Mill in the World. The Nugget™ is manufactured in the UNITED STATES OF AMERICA and marketed around the world. The Sunshine Nugget® has a powder coating baked on, for a durable white finish. This makes the Sunshine Nugget® easier to clean, and gives it the style and look of a fine kitchen appliance. 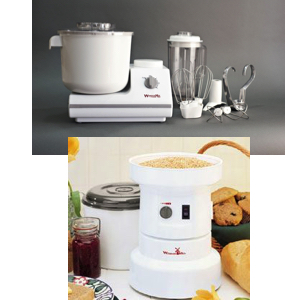 Over 30 years of research and development have gone into its advanced design. The one piece cast metal body makes it simple and strong. The Nugget™ is a top quality mill – don’t be misled by cheap imitations. Your survival could depend on having a superior product like the Nugget™. 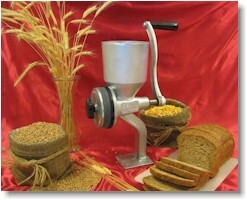 The Nugget’s™ superior design and high quality grinding stones give you fine flour the first pass through the mill. 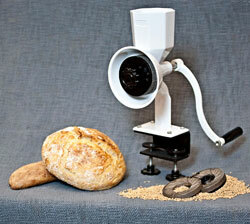 It can be easily adjusted to produce any consistency between very fine flour and coarse cereal. The Sunshine Nugget® has an attractive finish that gives it a great appearance in any kitchen, and allows for easy cleaning as well. The entire mill can be cleaned by removing one screw, taking the rotating stone off and simply brushing out the milling chamber. The grain hopper is over one quart in capacity and is a permanent part of the mill’s one piece design – no need to worry about accidental grain spills during grinding. A pan fits easily under the stones to catch the flour as it is milled, with no need for special apparatus or aprons to funnel the flour. The Nugget™ has been designed with special bearings that extend the life of the mill by eliminating excessive wear of the drive shaft. This design also allows the Nugget™ to be attached to your own electric motor or exercise machine for even easier use. Just remove the handle and attach a 12″ to 14″ pulley wheel – the milling shaft has already been modified with a keyway for easy hookup. Nazko Nugget Grain Mill – Silver – MADE IN THE USA!